Brainchild of the ex-Formula 1 star, Flavio Briatore, Billionaire Mansion is every bit as swanky as it sounds – although, it’s not quite a ‘mansion’. Made up of several different venues including an Italian restaurant, the Billionaire Grill and Japanese-led Sumosan (all of which are served in the same restaurant), plus a separate nightclub and karaoke lounge – Billionaire Mansion is one-stop destination for a great evening out – particularly for those celebrating a special occasion. 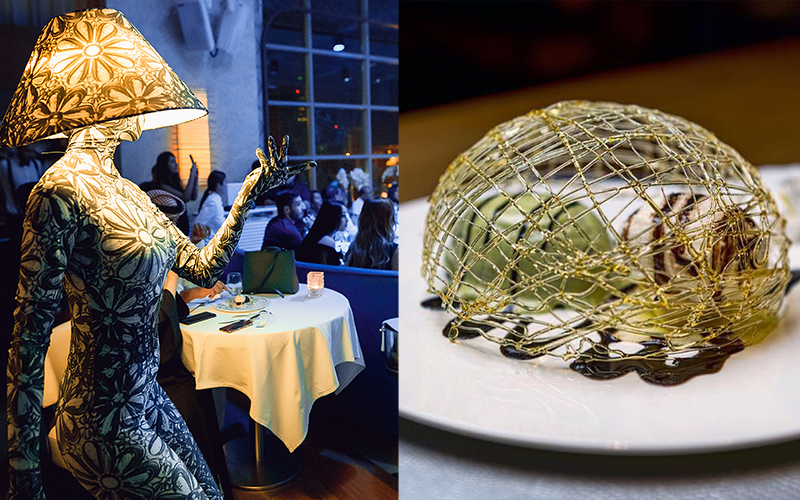 We visited to check out the restaurant’s newly launched ‘Dinner Party’, which sees diners entertained by a spectacle of performances every 15 minutes. When I say performances, I’m talking mesmerising trapeze artists, theatrical dancers, magicians, artists walking around dressed as lamps – the list goes on! The vibe is truly alive and energetic, with diners around us having a visibly great time (myself included). Overseeing the kitchen is head chef Batuhan Piatti, who is not only a superstar chef known for his appearances on Turkey’s MasterChef, but also the life and soul of the party – making regular appearances in the dining room to ensure all guests are satisfied and enjoying the food served. Although sushi and pasta aren’t naturally seen on menus together, somehow, Billionaire Mansion makes it work and it’s magnificent. The experience begins with delightfully creamy burrata with juicy, assorted cherry tomatoes, paired with a stunning portion of tender octopus and veal carpaccio – all served to share. An in-between starter course of varied sushi follows, showcasing fresh, chunky cuts of tuna, salmon and hamachi. For mains and the standout dish of the night, came the salt-crusted wild sea bass (for two), flambéed tableside and served filleted. Grilled langoustines follow, and are seasoned beautifully to rightfully allow natural flavours take the limelight. For dessert, things are kept light (for the most part) and refreshing, with a gorgeous platter of fruit sorbets and homemade ice creams – mochi included! Service here is suave, attentive and fun. As the evening progresses and the tempo picks up, service staff join in the party – dancing and all. The perfect venue to celebrate an occasion with a small group of friends. From the food to the show, Billionaire Mansion has its offering perfected across the board.